Kenilworth Lions Club is launching its ‘Dream Scheme 2019’ this week, to celebrate fifty years of charitable work by local Lions since the Club was founded in 1969. This is the first of a number of special initiatives throughout next year to mark this important milestone in the Club’s history. Funding of up to £1,000 per project will be available for individuals and groups in Kenilworth to apply for, and the Lions are particularly keen to reach out to those who may not normally have applied for funding support in the past. The pot of money to be used to fund the Dream Scheme initially will come from the expected profit from this year’s Boxing Day Duck Race in Abbey Fields. Duck Race tickets a £1 each are now on sale – look out for our stalls at the Christmas Switch-On events this coming weekend, and outside local supermarkets and at the Thursday markets. 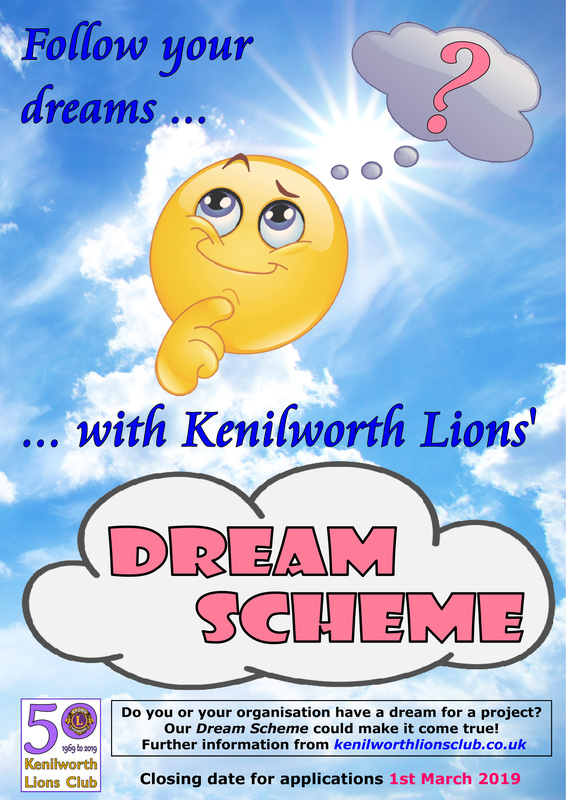 More information on the Dream Scheme is available here on the Kenilworth Lions web site or by emailing kenilworthlionsclubdreamscheme@gmail.com. Applications for funding can be made from now until the closing date of 1st March 2019, with all applicants being advised of the outcome by the end of April 2019. Application forms can be picked up at the Lions Furniture Store in Farmer Ward Road on Saturday mornings, or at the Kenilworth Centre Reception Desk on weekday mornings. Alternatively a form can be downloaded from the web site, or filled in online. If you are a Kenilworth-based organisation or individual and you have a “dream” of a project, which a grant of up to £1,000 would help you to achieve, make sure you apply!